Looking for the perfect 7.62x54R round for your next range day with your Nagant? Need one that keeps you shooting without worrying about the impact on your wallet? 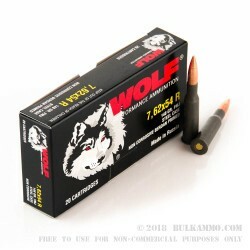 Stock up on Wolf Performance steel case ammunition, as this inexpensive ammunition features a steel-case coated in polymer for better feeding, extraction and long-term storage. 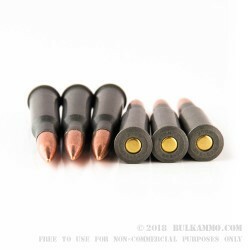 These rounds contain 147-grain full metal jacket, bi-metal bullets and are sheathed in non-corrosive, nonreloadable Berdan-primed steel cases. Although originally created for the Mosin-Nagant, this round will perform in any similarly chambered rifle. Each box of Wolf performance ammunition contains 20 rounds and there are 25 boxes in this 500-round case-- making it a great option for stocking up on for your next day at the range. A Russian-based company with headquarters in Placentia, California, Wolf is known for producing some of the most budget-friendly ammunition without skimping on quality or reliability. Wolf ammunition is manufactured in Russia in accordance with the standards of SAAMI and is available in a wide variety of calibers. 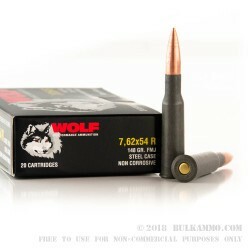 A: Hello Jay, This Wolf ammunition is loaded with a bi-metal jacketed bullet. Due to the steel in the bullet jacket, it will not pass any type of magnet test. 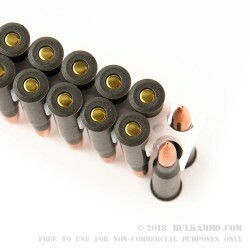 Q: Are these rounds corrosive? A: Hello Arthur, This Wolf ammunition is new manufacture and is not made with any corrosive components.